Super typhoon Nepartak hit eastern Taiwan early on Friday, driving thousands of people from their homes, disrupting power supplies and forcing the cancellation of more than 500 flights, emergency authorities said. Television broadcast images of strong wind and torrential rains brought by the year's first typhoon, whose approach had prompted Taiwan and neighboring China to batten down the hatches. As many as 15,400 people were evacuated from their homes in preparation for the storm, while 187,830 households suffered power outages, emergency officials said. One death and 66 injuries had been reported. Bullet train service had been suspended, and more than 300 international and 254 domestic flights canceled, an emergency services website showed. Tropical Storm Risk has rated the typhoon as category 5, at the top of its ranking, but the super typhoon should weaken to a tropical storm by the time it hits China. 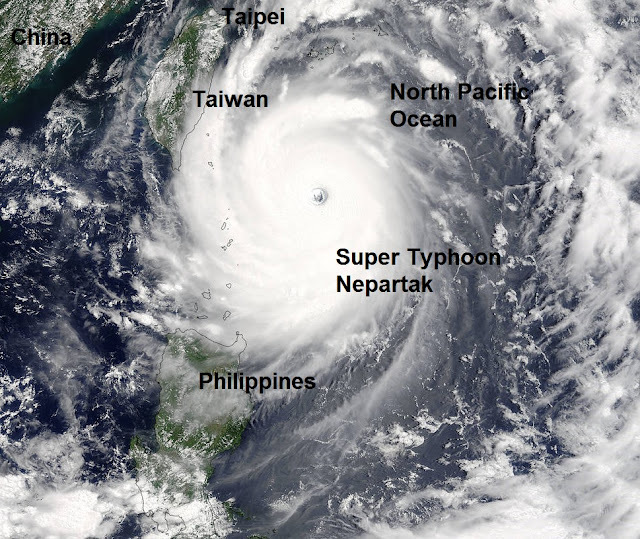 Super Typhoon Nepartak is the strongest storm in the western Pacific since Super Typhoon Souldelor in August 2015. Equivalent to the average annual rainfall of New York City set to be dumped on Taipei. Super Typhoon Nepartak is barreling toward a potentially devastating direct hit on the island of Taiwan on Thursday night or Friday morning local time as a Category 4 or 5 storm. It has maintained its Category 5 intensity for nearly two full days - a rarity for any tropical cyclone, with a peak intensity of 175 miles per hour sustained winds at one point on Wednesday. As of Thursday morning eastern time, the storm was packing maximum sustained winds of 160 miles per hour, and was located about 225 miles southeast of Taipei. It was moving west-northwest at 9 miles per hour. Tapping into unusually mild ocean waters and unencumbered by any inhibiting atmospheric conditions, the storm intensified from a Category 1 storm to a Category 5 within a 24-hour span during July 4 and 5. Typhoon Nepartak is the most powerful to form so far this year anywhere in the Northern Hemisphere, and it is likely to cause widespread flooding and mudslides when it intersects with Taiwan's high terrain. 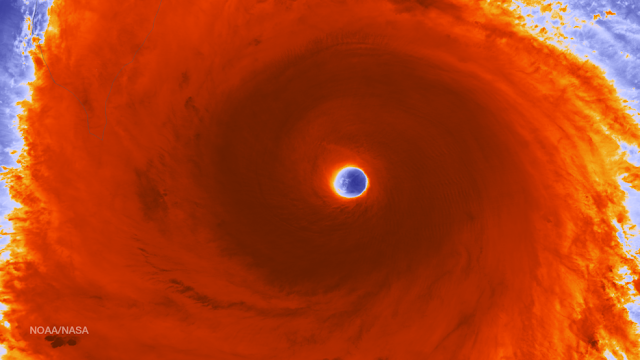 Taiwan is no stranger to tropical storms and typhoons, but if Nepartak hits as a Category 5 storm it would be among the strongest storms to hit there in several decades. High winds, torrential rains and high waves will affect much of the island, including the city of Taipei. The storm is weakening as it approaches the island, but it is running out of time to weaken significantly before crossing the coast. This means that it is likely to still be a Category 4 or 5 storm when it makes landfall. The storm has taken advantage of abundant warm waters and low atmospheric wind shear to explode in intensity and maintain its extraordinary strength. Taiwan's Central Weather Bureau has issued typhoon warnings, extremely heavy rainfall warnings, as well as "extremely torrential rainfall" warnings for much of the island, with the core of the storm expected to hit the east-central coast, potentially bringing some of the worst winds and highest storm surge flooding to Taipei. During Thursday afternoon and evening in Taiwan (Taiwan is 12 hours ahead of eastern time), conditions will rapidly deteriorate as the initial rainbands from the storm begin lashing the coast. The storm track poses a particular threat to Taipei, a city of nearly 3 million people, since it will likely be on the northern end of the storm's strongest winds in its large eyewall, where the core of the highest winds are found. If eyewall winds encroach upon the city, then that will likely dramatically increase the number of people affected by power outages and damage to structures. According to weather.com, Typhoon Soudelor caused the largest power outage in the history of the electric utility there, leaving 3.6 million customers without power. In addition to the high winds, another major threat to Taiwan is extremely heavy rainfall that will likely trigger flash flooding and mudslides. Super Typhoon Soudelor dumped more than 4 feet of rain in Yilan County, Taiwan, which is a mountainous area the northeastern part of the island nation. This is about equivalent to the average annual rainfall of New York City.